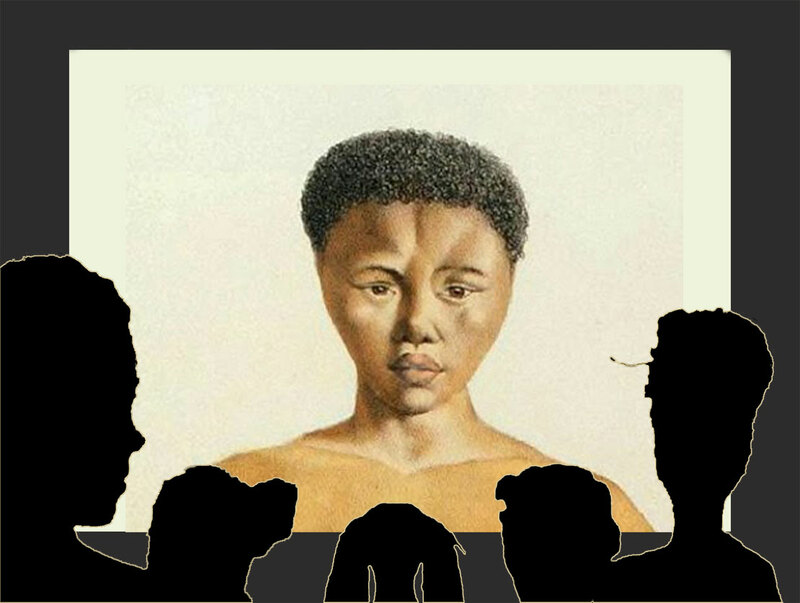 Teaching African Women in Cinema, Art and Culture – Part 6 - The class theme examines issues around voice and representation drawing from the story of Saartjie Baartman—the woman, and the Venus Hottentot—the name given to her as spectacle. As part of the course activities, students attended a talk that I gave the evening before the class session entitled: “The black woman in the French imaginary.” During the presentation they were introduced to Sara Baartman's story, the history and evolution of the ethnographic and colonial gaze, and the notion of the image as a construct. I intentionally structured the course to introduce these elements after already presenting African women with agency, voice and having their own gaze. The talk framed these components as well, though its main focus was black female representation in France, which included women from the Caribbean as well as African American women. The materials to read in preparation for the film viewings of The Life and Times of Sara Baartman and The Return of Sara Baartman both by Zola Maseko included Zine Magubane’s “Which Bodies Matter? Feminism, Poststructuralism, Race, and the Curious Theoretical Odyssey of the ‘Hottentot Venus”’ (Gender and Society 15, 2001), “Displaying Sara Baartman” by Sadiah Qureshi. History of Science (2004), Letter from the President: Thabo Mbeki, Saartjie's return restores our common dignity, the iconic poem “I’ve come to take you home” by Diana Ferrus and references to Vénus Noire : Une histoire de violences (with my translation from French). The problem posed for critical reflection and discussion encompassed several themes: the notion of the image as a construct: when Sara Baartman’s identity becomes a construct by others; the question of voice: who tells Sara Baartman’s story? : Sara Baartman’s story spans more than 200 years, as she continues to be of interest in the academy and in cultural productions—among artists and filmmakers—and more relevant to the issues that I wanted to explore in class, as a site of memory for South Africans. And thus some points for debate: How may one analyze, discuss, compare these disparate representations and periods in time? How does one know, understand, tell Sara Baartman’s story? 1) European travelers/settlers and the constructed ideal of the “Bushman”; 2) Scientific racism--constructions of race – hierarchy of the races – categorization of all things; 3) Human spectacles, freak shows, human zoos—anything considered different may be exhibited; 4) Sara Baartman and the Venus Hottentot as a theoretical construct /object: othering, alterity, deviant sexuality, abnormal anatomy, social construction of black femininity; 5) Artists and representations: reclaiming or re-appropriating Sara Baartman/the Venus Hottentot? ; 6) The celebration of the return of Sara Baartman by South Africa, the Khoisan people and the emergence of a national icon. What struck me most about this class session was the students’ shock, dismay, even sadness. Many weeks into the semester after the empowering, positive, affirming representations and stories of and by African women, here is a 200-year old story of a racist, sexist, debasing experience that a young woman of Southern Africa endured! The discussion turned to my methodology: wanting to begin with a non-deficit approach, rather than to start with a chronicle of colonial, ethnographic, Eurocentric representations, and then explore how the gaze was/is returned. Sara Baartman is the first woman we have studied this semester whose story has been predominantly told by others. Coming into the semester, I likely would have welcomed the chance to critique the portrayal of an African woman through historical contexts. Having already taken part of the course, however, changed my perspective and this week has been more of a challenge for me. I believe the thing that has changed over the past couple months is that I have become more aware of the relationship between power and storytelling. What I am left with is this heavy sadness over Baartman’s story and internal conflict over whether or not I believe it is right to continue giving her attention as an object of historical or physical curiosity or if we must forget her to let her rest in peace (Tommy Carlson '14, Denison University). I believe that the European perspective has had tremendous influence on how this story is told. Even Diane Ferrus, one of the women who played an integral part in bringing the remains of Sara Baartman back to South Africa said that she, a Khoi Khoi woman herself, did not learn about Baartman until taking a class in Holland. That information was unsettling, but not surprising in the least bit. Therefore, I return to the originally posed question. Who has the power to tell this story? I believe that no matter how many collected and archived pictures, drawings, and literature we have access to in this day and age Sara Baartman’s full story remains untold. I say this given the discrepancy dealing with Sara Baartman’s real name and identity. We simply do not know. The better question might ponder the power of interpretation of this story and the ways in which we frame all African women because of it (Rian Matthews '16, Denison University). Does the present sexualization of black women continue the Baartman spectacle? I would argue that the Baartman-related sexualization and exploitation of the black female form is still an ongoing issue in today’s media and social culture. In further reference to Baartman and the injustices of her captivity and oversexualization, she becomes again an overdetermined specimen. Even through modern representation, Baartman appears as a case study, and a cultural allegory. She does not hold relevance for her person, but rather for her tragedy (Caroline Clutterbuck '16, Denison University). Baartman’s story is important in that her experience, in life and long after she had passed away, teaches us something troubling about ourselves. She exemplifies the way that an individual can be used to make generalizations about a group of people. Her story also demonstrates the ways that even those with the best intentions can dehumanize and objectify others. Her return to South Africa to be acknowledged, respected as a human being, and buried so she can rest in peace is ultimately the best thing that could have happened for her. Letting her go from the public imagination and losing her body to the Earth is the first major acknowledgement that she is ultimately just a human being that is no more worthy of anatomical study than I am or any other randomly chosen person on the planet. I believe that it is time that we let her go, but that we carry with us the lesson of how easy it is it strip someone of their humanity based on perceived difference and that we must learn, through openness to diverse stories, to acknowledge shared humanity over that tendency to focus on that which makes us different (Tommy Carlson '14, Denison University).